Foothills Golf Club lies just a few miles south of Phoenix and is one of the many outstanding golf courses in the Scottsdale area. It proximity to other golf courses and the city coupled with its undoubted quality makes this a must while on a golf holiday in Arizona. Foothills Golf Club is a golfers paradise and the clever layout caters to advocates of the power game and those who employ more a more cautious strategy. 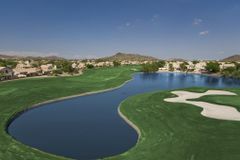 Internationally acclaimed architects Tom Weiskopf and Jay Morrish designed the course and since its inception it has forged a strong reputation as one of the finest golf courses in and around Phoenix. The course stretches to almost 7,000 yards and the sweeping undulations coupled with an endless amount of cavernous bunkers give the course a distinct links feel. Set that against the dramatic rocky desert background and you have the perfect recipe for an astonishing desert golf course.